Do you like scary movies? Then you'll love Fright-Rags new GhostFace collection! In honor of the 20th anniversary of Wes Craven's Scream, the renowned horror shirt company has partnered with Fun World, creator of the unmistakable mask, to release a line of GhostFace shirts. Justin Osbourn's glow-in-the-dark design featuring the knife-wielding GhostFace is available on unisex shirts, girls shirts, and baseball tees. Coki Greenway's take on the iconic visage comes on unisex shirts, girls shirts, and tank tops. Abrar Ajmal and Kyle Crawford have designs that will make you scream on unisex and girls shirts. The GhostFace Collection is on sale now at Fright Rags. Quantities are limited. So never, ever, ever, under any circumstances, say, "I'll be right back." Fright-Rags' next release will be a Midnight Madness tee, an exclusive shirt available for only 24 hours. The hunt begins this Saturday, July 30. Scream was released on December 20, 1996 and is still the highest-grossing slasher film ever. It was directed by Wes Craven from a script by Kevin Williamson. The original movie starred Neve Campbell, Courteney Cox, and David Arquette, all of whom returned for three more sequels. 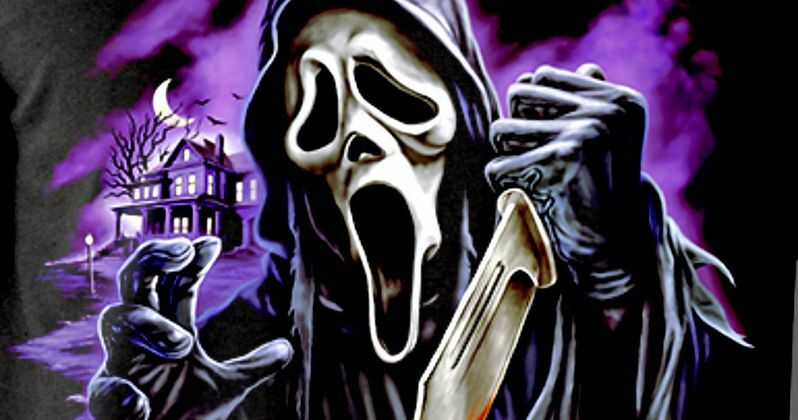 Scream 2 arrived December 12, 1997 followed by a third installment, Scream 3, released February 4, 2000. Eleven years after the previous film, Scream 4 was released on April 15, 2011. The movie series follows Sidney Prescott (Campbell) who becomes the target of a succession of murderers who adopt the guise of Ghostface to stalk and torment their victims. Sidney teams up with town deputy Dewey Riley (Arquette), reporter Gale Weathers (Cox), and film-geek Randy Meeks (Jamie Kennedy) to beat the notorious Ghostface in the first film, and the following Scream movies would all follow a ver similar pattern. A TV show of the film series was released by MTV on June 30, 2015. The series follows different characters and new story lines, and is not connected to the film series. As you'll see in this new shirt collection, these latest collectables from Fright-Rags bring back the original Ghostface. Check pout all the cool new shirts that Fright-Rags has to offer.